A family has a diverse cast of characters: old and young, the proud and shameful, the narrow and open minded, the extroverts and introverts, the traditionalists and forward thinkers! 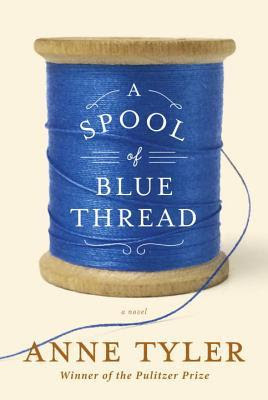 Pultizer Prize winning author, Anne Tyler, has captured all those unique family dynamics of four generations "Whitshanks" in her latest novel," A Spool of Blue Thread"! The stage of this family story is played out in a house that Junior Whitshank built in post-Depression Baltimore suburb for his wife, Linnie Mae, and their young children, Red(cliffe) and Merrick. Junior, with his hard work and determination, sets out to pursue the American Dream of success for his family which meet equally with triumphs and disappointments. Later years, Red and Abby inherited this family in which their grown children, Denny, Amanda, Jeannie, and Stem, all come together with their young children! One of my favorite characters is Abby Whitshank who is the "heart" of this family and community! As mother and grandmother, she is very vested in everyone's lives and wants everyone to be happy! I enjoyed this summer read and highly recommend this novel who enjoys a good story about family!! Sounds like an interesting read. I haven't read a book in forever but it is something on my to do list. I highly recommend this book to read then! Thank you for checking out my book review! I need to find more book bloggers/groups to discuss books as part of my lifestyle aspect of my blog! I'm an Anne Tyler superfan! I've been reading her since the late 80's. All of her books are SO GOOD! The Accidental Tourist is on my top 10 favorite books of all time! Thank you, Davis!! I need to read the Accidental Tourist myself!! Perfect during cold Fall/Winter nights!